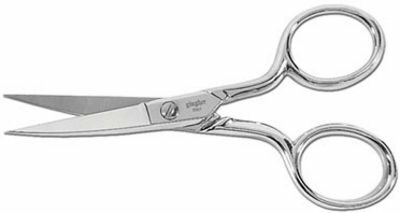 Slightly thicker blades allow this scissors to be used for cutting one layer of fabric as well as for needlework embroidery. The curved, narrow blades and sharp points enable close cuts while working above the work surface. Durable doubleplated chrome over nickel finish. Includes a fitted sheath and tin for storage.